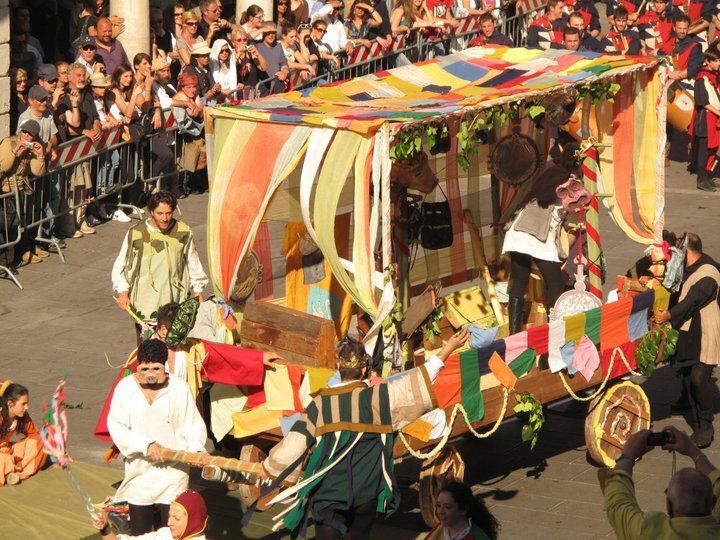 One of the biggest selling points to visiting Umbria in spring is the plethora of wonderful traditional local festivals, during which the region awakens from its long winter hibernation and welcomes spring with open arms. Pasqua/Pasquetta (Easter weekend from Venerdì Santo through Pasquetta). Easter is not about a bunny in Umbria; it remains a solemn and deeply religious holiday which begins the week before Easter Sunday. 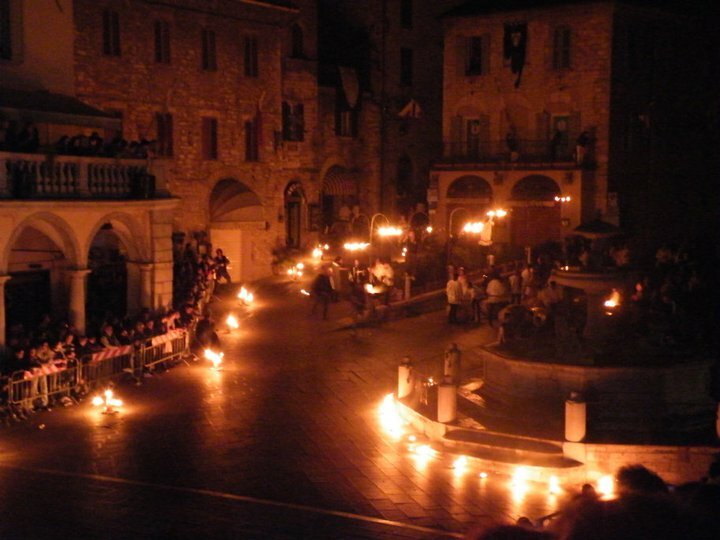 On Venerdì Santo (Good Friday), many Umbrian towns hold costumed religious processions, when (often barefooted) monks and members of religious fraternities transport statues of the Virgin and/or Christ along torch-lit medieval streets. 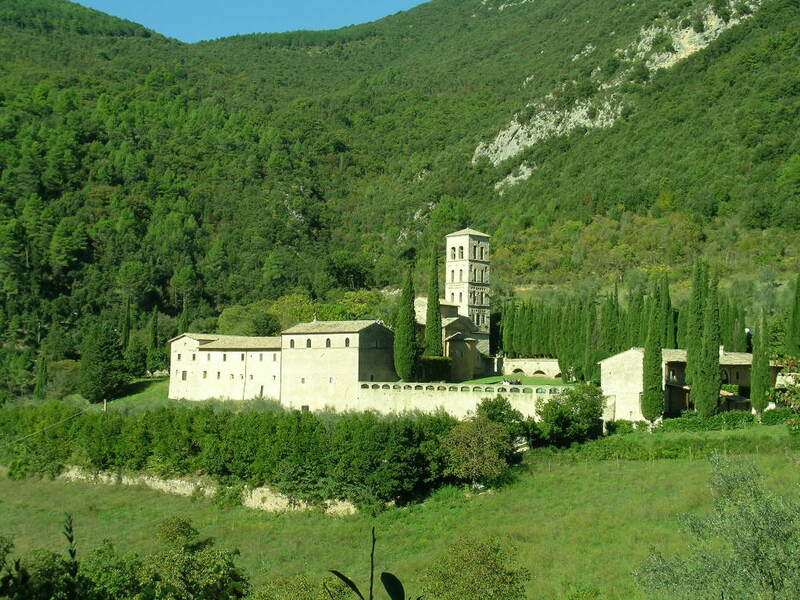 One of the most moving is in Assisi, where the statue of Jesus is taken down from the cross inside the Cathedral of San Rufino and transported on a canopied litter to the Basilica of Saint Francis and back. Many other towns–Todi, Norcia, Montefalco, Perugia, and Gubbio, to name a few—hold a Stations of the Cross pageant reinacting the martyrdom of Christ. On Pasqua (Easter Sunday), most Umbrian families attend Mass and enjoy a long leisurely lunch together. After lunch, both children and adults unwrap the brightly colored mylar paper around their huge chocolate eggs, breaking them open to reveal the sorpresina prize inside. Pasquetta (Easter Monday) is usually spent with friends, often day-tripping to another town for a passeggiata or walk down the Corso. One of the most popular events in Umbria on Easter Monday is the Ruzzolone cheese rolling race in the pretty town of Panicale. Huge wheels of cheese are rolled along a course around the village walls, and the winner is feted with music and wine in the piazza. Giornata Nazionale delle Ferrovie Dimenticate (National Forgotten Railways Day)—This is one of my favorite annual events, during which ex-railway lines (many now retrofitted as hiking and biking trails) are highlighted with organized excursions, railway museum visits, and period photography shows. This year the events are during the weekend of 5-6 April, but unfortunately the website is only in Italian. Giornata FAI (Open Day for the Italian National Trust)—FAI is a non-profit fund which protects artistic, historical, and natural treasures in Italy. Many of their sites (if not the majority) are closed to the public for most of the year, but for one weekend annually (26-27 March in 2011) some of the most unique and breathtaking of these open their doors for guided tours and visits. If you are passionate about off the beaten track villas, castles, monasteries, and parks, this is an event to watch. Settimana della Cultura (Culture Week)– The Ministry for Art and Culture has periodic discount days for State museums and monuments across Italy. During the annual Culture Week (9-17 April in 2011), all State-owned museums, monuments, and archaeological sites are open free of charge and some organize special events, guided tours, and extraordinary openings to closed sites. La Corsa all’Anello (The Race of the Ring), Narni–In one of the most beautiful (and off the beaten path) hilltop towns in the region, you will find the epitome of the Umbrian festival: medieval pageantry, costumed locals, banner-festooned streets, outdoor taverne with food and wine, torchlit processions, and, of course jousting. Festa del Tulipano (Tulip Festival), Castiglione del Lago–After World War II, a group of Dutch families resettled on the shores of Lake Trasimeno to coltivate tulips, and with them came the tradition of celebrating the arrival of spring by decorating the town with the petals of the first tulip blooms, which were too short to be sold at market. The Dutch no longer raise flowers here (though there is a concentration of Dutch expats around the lake still), but the tradition continues in decorated floats, flower shows, and petal-strewn streets. 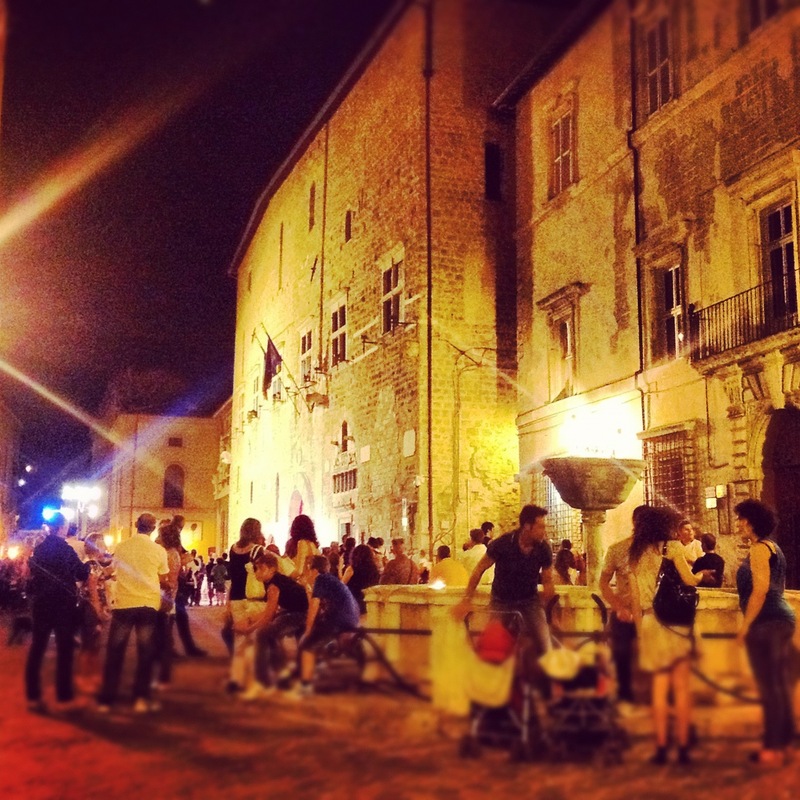 Picnic a Trevi–Art, music, and food among the olive groves of lovely Trevi. Antiquaria d’Italia (Antique Show), Todi–One of the most important and prestigious antique shows/markets in the area, in the beautiful period Palazzo Landi Corradi. Calendimaggio, Assisi–Perhaps the most spectacular of all Umbrian festivals, with its squaring off of the two medieval halves of the town–the “Parte di Sopra” and the “Parte di Sotto”—who challenge each other during three days of costumed pageants, medieval reenactments, vocal and instrumental concerts, dances, processions, archery, crossbow, and flag corps competitions. Splurge for tickets so you can get a good look at the action in the main piazza (the most breathtaking show is Saturday night, when antics with fire play a huge part). Festa dei Ceri, Gubbio–“A candle race” doesn’t quite capture the over-the-top town-wide frenzy that takes over this otherwise stoic village on May 15th each year as three teams carry gargantuan wooden “candlesticks” on their shoulders and precariously charge through the thronged streets to the deafening cacophany of cheering, drums, and bells. Cantine Aperte (Open Wineries)–Wineries big and small open their doors across Umbria (but concentrated in the Sagrantino-producing area near Montefalco) for tastings, guided tours, and special events. La Palombella, Orvieto–A caged dove representing the Holy Spirit descending upon the Apostles follows a wire from the Bishop’s palace over the heads crowding the piazza to end in a fireworks display on the opposite side in front of the basilica’s breathtaking facade. The festival is held on Pentecost Sunday, so dates vary. Do you know of the fava bean festival in Monterubiaglio? I read in de Blasi’s book that it is every Sunday beginning in March. I am wondering the dates, and if you think it is worth an excursion. Can you tell me when the asparagus festival in Eggi will be this year? I am looking for any events in southern Umbria on April 28th. The official dates aren’t out yet, but I called a friend in the know who told me he’s pretty sure it goes from 28 April to 8 May in 2011. That would be awesome, I think it sounds like fun. Any suggestions on where I can keep checking to see if those are indeed the dates? The official website is http://www.amicidieggi.it…but they don’t have 2011 info up yet!